UNBREAKING THINGS WAS OUR DESTINY. 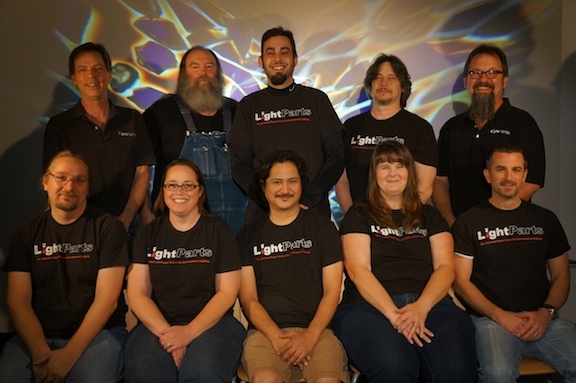 LightParts was founded in Jan 2004 by Don Pugh and Robert Mokry as the worldwide service center for High End Systems' legacy products such as Intellabeam, Emulator, Dataflash, Laser Chorus and other popular products. Industry support led us to become the first dedicated lighting parts and repair center for entertainment lighting that was not a production or installation company. We now support most major brands such as High End Systems, Martin Professional, Element Labs, Vari Lite, Flying Pig Systems, Jands, Wybron, Coemar, Color Kinetics, ETC, Clay Paky — you name it! When asked for a one sentence mission statement, we say "LightParts is the 'one stop shop' for entertainment lighting parts and repairs". What makes this possible is our exceptional staff. LightParts is fortunate to employ some of the true legends of our industry in the field of automated lighting technology. This expertise is at your fingertips when you call or email, and it shows in our repairs, parts being in stock and the right parts being in the box when it arrives — and at the right destination too. LightParts understands that tours aren't in the same place every day — no hassle shipping is standard. Couple all this with a low minimum order and no goofy "packing and handling" fees, and you'll understand why LightParts is The Parts and Repair Source for Entertainment Lighting.